Expand USB connectivity by connecting four USB 3.0, 2.0, or 1.1 devices to any USB 2.0 or 3.0 capable desktop, laptop, or tablet computer. 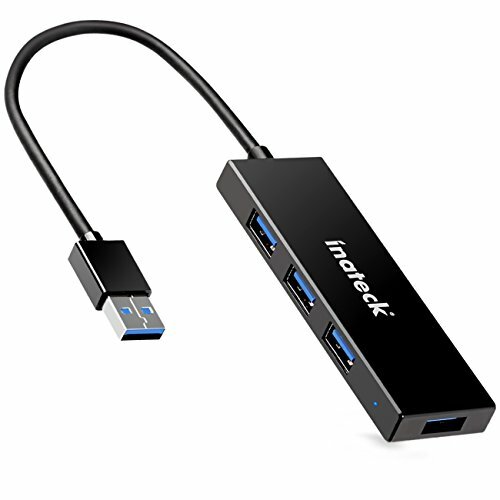 The Inateck USB 3.0 4-Port Hub provides a transfer speed up to 5 Gbps, which is 10X faster than USB 2.0. The sleek design is portable and pairs nicely with low profile laptops and ultrabooks. It easily fits on office tables or in your bag on business trips. Plugging the USB 3.0 cable from the hub connects users to their entire desktop peripheral environment. No external power supply unit is required, and there is no need to plug in or install anything else before you connect any device or external storage. Build in Overvoltage/Overcurrent/Leakage and Short-Circuit protection unit. The LED indicator on hub can tell the working status of this hub. -For stable operation, devices connected to this hub should not exceed a combined current of 5V 900mAh. Do not connect it to more than one high power-consuming device, such as HDDs, certain office equipment, etc. -This usb 3.0 hub is not meant to serve as a stand-alone charger. It is not compatible with iPads or any other devices with irregular charging requirements. -2.4 GHz wireless devices, MIDI devices and some USB 3.0 devices may not be compatible. Please try to use the host port or a USB 2.0 connection.